DATE OF EVENT The 1st, 3rd and 5th Sunday of every month. See our Main Calendar . TIME Usually 6:00 PM - 10:00 PM. Occasionally runs later. See our Main Calendar for exact times . Held at Stepping Out Studios, 37 West 26th Street (between 6th Avenue & Broadway), 9th floor, Manhattan, NYC. Studio phone - 646-742-9400. Click Here For Map to Stepping Out Studios . Travel instructions are below. PRESENTED BY Instructor, performer and DJ Jimmy Anton. CONTACT INFO Phone 212-929-1413. Web site www.JimmyAnton.com . Email Jimmy_Anton@hotmail.com . 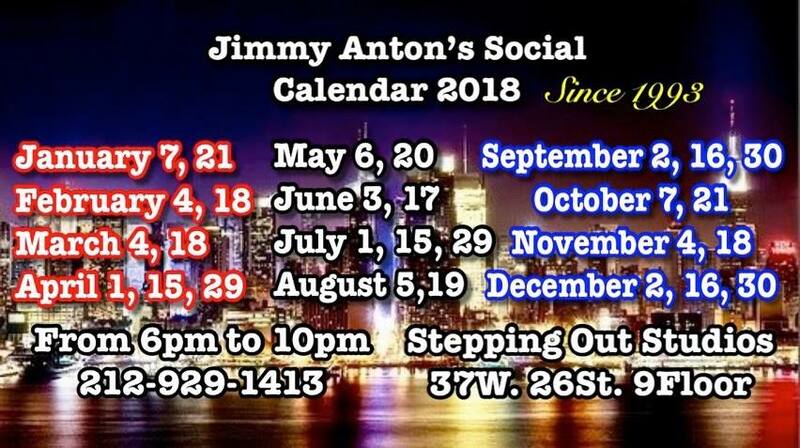 Jimmy Anton Social FaceBook Page - https://www.facebook.com/jimmy.anton.14 . TYPE OF EVENT & VENUE New York's largest, most popular and longest running mambo social held in a huge dance studio. An average of several hundred On 2 dancers, at different levels, come to this social. MUSIC Entirely pure classic salsa plus a little cha cha played on an excellent sound system. DJ DJ Jimmy Anton and invited guest DJs. BAND Very occasionally. They would be listed on our Main Calendar. DANCE FLOOR Very large wooden ballroom dance floor which is "medium speed", although some areas get a bit sticky late in the event when the humidity rises. PRICES Regular admission is $14. When there is a band or a special event such as Jimmy's birthday or an anniversary for this social, or part of a big salsa festival or congress, the price may be anywhere from $16 to $25. Contact Jimmy for exact prices for special events. BEVERAGES AND FOOD There is a cash beverage counter in the back with water, sports drinks and other beverages. Earlier in the evening there are free chips, salsa sauce and muffins until they run out. DRESS CODE Very casual. Come as you are or dress hot for steamy dancing. DESCRIPTION The longest-running and biggest mambo social in New York, started in 1993, and one of the best! See Longest Running & Best Social. It's got good music played on a great sound system, a large & excellent dance floor, midtown Manhattan location, consistency, and attendance by several hundred On 2 dancers every time, even in snow storms, and that usual includes dancers from out of town and even from other countries. Large dance studio type space with AC, many willing dance partners at different levels. 99% of the dancers "break On 2". A full evening of salsa music, with an occasional cha cha, being played by Jimmy as the DJ ,with occasional invited guest DJs, dance teams and bands (see Calendar ). Overall, this is a top notch On 2 event, highly recommended, with a great diversity of dancers coming from different parts of the NY/NJ metro area as well as national & international visitors. Dress is very casual; in fact, dress to sweat! This is a "3 t-shirt event". Click on Jimmy Anton Social Pictures to see photographs of this event by Amir Shimoni on his web site www.MamboPics.com . Held at the Stepping Out Studios, 37 West 26th Street (between Broadway and 6th Avenue/aka Avenue of the Americas). For exact location on a map which you can zoom in and out, Click Here For Map. By Subway - Closest subway stations are the 23rd or 28th Street Stations on the N, R or W lines, and also the 23rd Street Station on the F or V lines. By Car - There is street parking nearby if you drive around the block a few times. Be sure to read the parking signs VERY CAREFULLY. Some of them have night parking restrictions. OTHER INFORMATION Click on Jimmy Anton - Instructor for info on his classes, and Jimmy Anton - Performer for info on his performing. To see Manny Siverio's description of this event in our Dancer's Magazine, click on Longest Running & Best Social . See Manny Siverio's other articles on Mambo Social Dances in SalsaNewYork.com's Dancer's Magazine. To see Stepping Out Studio's web site, click on Stepping Out Studios .